This is an intensive 2-day primer on International Trade Finance. This course has been tailored for professionals in shipping and maritime companies who need to gain a closer understanding of all aspects of the financing of international trade. ▶ Learn of the key role that specific shipping documents play in ensuring payment. ▶ Understand different types of payment mechanisms, such as Letters of Credit, Documentary Collections, Open Account; how they operate and the risks that each carries. ▶ Learn about the role of the financial industry as the key element in ensuring DvP (Delivery versus Payment) in international trade finance transactions. ▶ Gain insights into the role of the ICC (International Chamber of Commerce) and international conventions in facilitating the smooth flow of goods versus payments. ▶ Attain a knowledge of the different trade payment instruments and their processes. ▶ Learn about relationships between buyers/importers and sellers/exporters and the financial services industry to ensure seam less secure transactions in international trade. 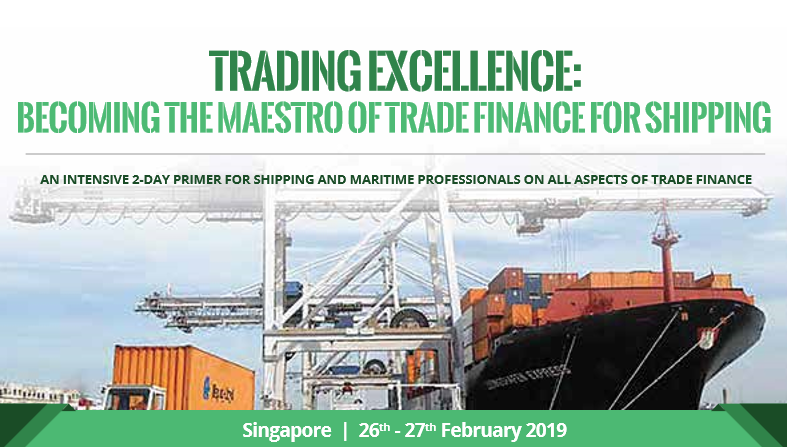 This course will be of especial interest to shipping and maritime professionals who wish to expand their knowledge base enhance their expertise to include a better understanding of the international trade finance arena.